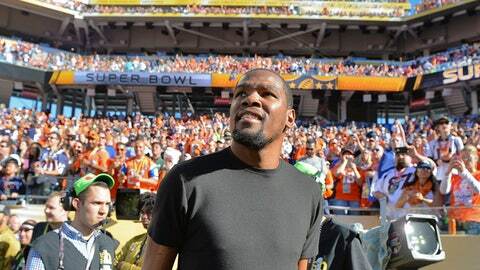 Oklahoma City Thunder star Kevin Durant was on the sideline for Super Bowl -- working as photographer for The Players' Tribune. It turns out neither Stephen Curry nor Kevin Durant had a ‘win-win’ weekend. You might recall Curry’s prediction last week for a Golden State Warriors win over the Oklahoma City Thunder on Saturday followed by a victory for his hometown Carolina Panthers and pal Cam Newton in Sunday’s Super Bowl. Curry, whose Warriors hung on for a tight win over the Thunder, went 1-for-2 after Newton and the Panthers lost to the Denver Broncos. And it turns out Durant did, too. The Thunder’s road trip to the Bay Area was perfect timing. The Oklahoma City star crossed the bay for Sunday’s Super Bowl 50 in Santa Clara, equipped with a sideline pass and a camera. Likely the tallest cameraman in Super Bowl history, Durant shot the game for The Players’ Tribune. Turns out the NBA All-Star is also a pretty good shot with a high-tech camera. Check out his photographs from the big game, in his article: "My View from Super Bowl 50."